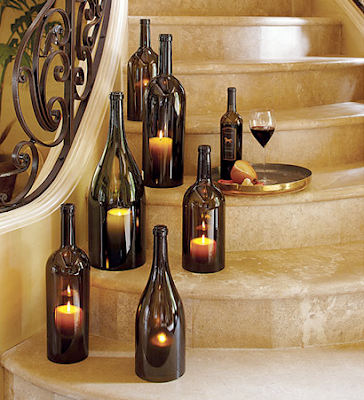 100% authentic over-sized wine bottles are hand cut, smoothly polished and slip right over a candle. When lit, the bottles glow with a flickering internal candlelight. Various sizes include a 5L Bordolese Prima, a 3L Bordeaux Francese, a 6L Champagne Mathusalem, a 3L Bordolese Prima or a 3L Burgundy. Buy them here. I love these! I'm curious, are these for sale? If so, how much?